Day 102: Sunday, August 25, 2013. Currently in Blue Springs Missouri. After leaving Sheridan we drove through the high plains where we saw ranches, several herds of pronghorn antelope, and prairie dogs beside the road. 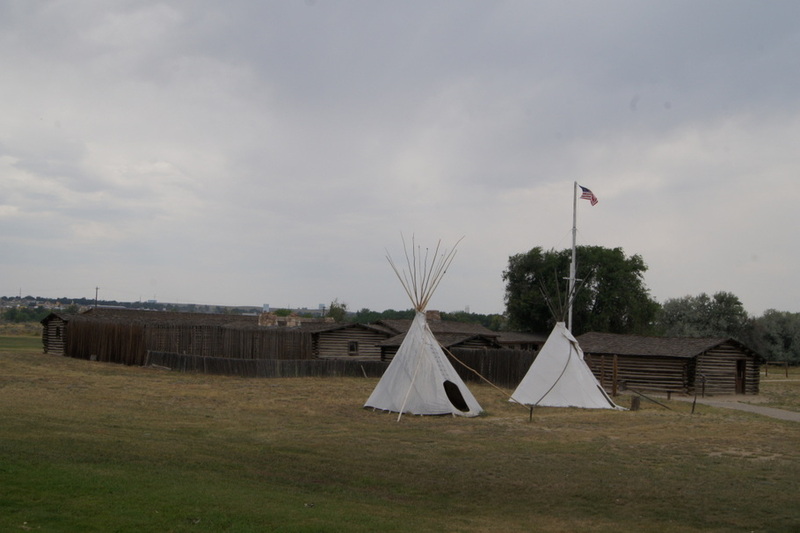 We spent a night in Casper, Wyoming at Ft. Caspar RV Park where we visited Fort Caspar on the North Platte River. Before heading into the plains of Kansas we stopped for two nights at Riverview RV Park in Loveland, Colorado where we had a campsite right on the Big Thompson River. Kicking back and listening to the river was pure heaven. The next day we drove about 30 miles to the entrance of Rocky Mountain National Park to make the drive along Trail Ridge Road. On our visit to the park Memorial Day weekend in 2011 we attempted the drive but had to stop near the beginning of the road because of snow on the road. The drive was beautiful and we saw plenty of wildlife. We went over the highest point of the Trail Ridge Road. At 12,183 feet, it was the highest elevation we have been to on this entire trip. The drive from Loveland to our next stop at the Wakeeney KOA in Kansas took us through cattle country. We drove by stockyards with more cattle than I have ever seen. The winds were strong all day and Henry was fighting a strong headwind for much of the day. We passed by huge wind farms in Colorado and Kansas. After driving almost 400 miles we stopped in Wakeeney, Kansas for the night to rest up before another long day of driving through Kansas. The next morning we continued our trek east through Kansas where we continued to see cattle and fields of corn, wheat, and other grains. Wild sunflowers grew beside the highway. We started hitting city traffic in Topeka and drove through Kansas City, the biggest city in Missouri. Going through the city was a lot like going through downtown Atlanta – not fun. 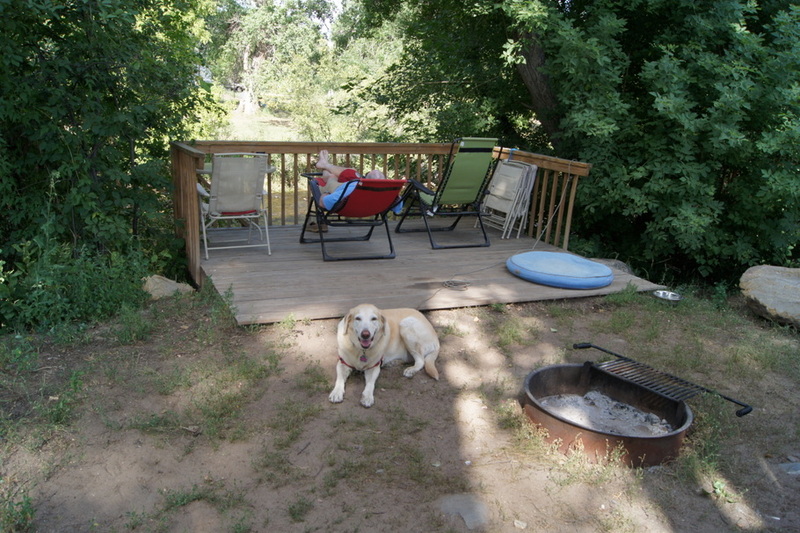 We spent the night in Blue Springs Campground, a nice, quiet county park in Blue Springs, Missouri. Our wildlife sighting of the day was two deer in the park. Nice wildlife in Colorado! I don’t think you could ever drive through Rocky Mountain NP without seeing some kind of wildlife. Enjoy the rest of your trip home and the Georgia football game. See you when you return to Tybee. Sherry, I wasn’t expecting to see so many sheep close to the road. It was an unexpected treat. Speaking of the atrial Ridge Road reminds me of the summer I worked in Estes Park, 1972. It was a rainy Fourth of July at 8000 ft., but we decided to drive the Trail Ridge anyway. It was bumper-to-bumper, and nothing to look at because of the clouds. But suddenly, we were above the clouds, and it was brilliantly sunny. To see the peaks floating in a sea of clouds was breath-taking! In August, we climbed Long’s Peak, 14,256 ft., a tradition for students who worked there for the summer. Seventeen hours and 11 miles later, we celebrated our feat (and rested our sore feet) by having a Coors beer! Priceless. Will you be coming through St. Louis? It would be wonderful to meet you somewhere as you pass through, even if it’s for 10 minutes! I will email you my phone no. Jean, what great memories from college! RMNP is one of our favorite national parks. I’m glad we were able to stop there on the way home. Sorry we weren’t able to see you in St. Louis.